It's an exciting day as we get to introduce our December Leading Lady, Kimberly Rendino! Kimberly's style is bold, dramatic and extremely well balanced and we have certainly noticed her work when she's entered our challenges! In a fact we invited her to be on the w&w blog a while back and you can see here work HERE and HERE. 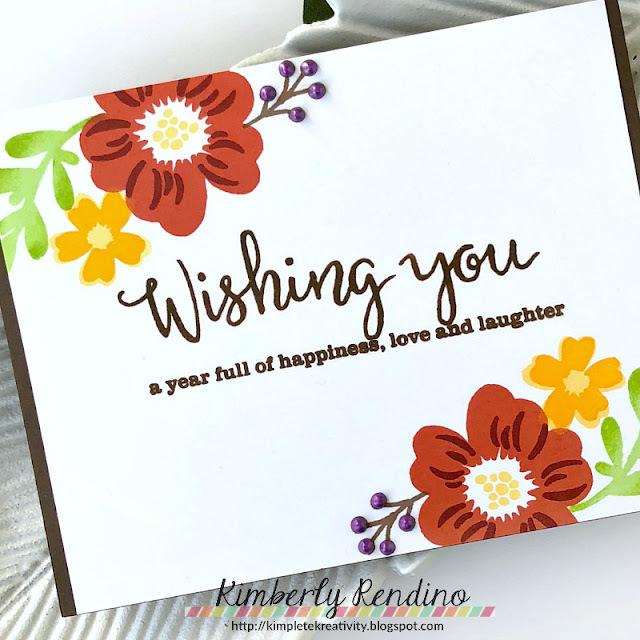 I am really excited to see what Kimberly will be creating this month as she takes us on an adventure of her own design on Saturdays in December on the w&w blog. Please give Kimberly a big round of applause to welcome her as she steps onto the stage for her first performance as our December Leading Lady! Hello there! 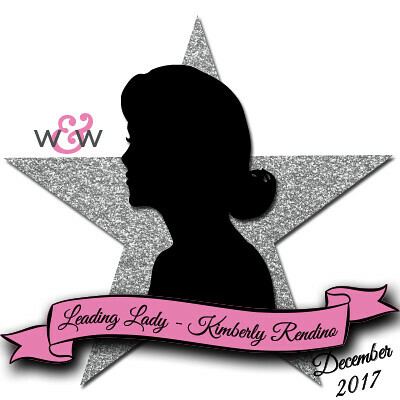 My name is Kimberly, and I am so very excited to be w&w's Leading Lady for the month of December! It's such a thrill to be guesting for one of my very favorite companies - many thanks and big hugs to Shay for inviting me to share with you this month! So....it's December and everyone is probably expecting me to share some holiday cards - right? Well, we will definitely get to that later in the month, but today I wanted to focus on how the latest w&w release full of holiday goodness can be used year round! First up, a super colorful birthday card using the Cover Model: Do You See What I See? Cutaway. Can I just tell you how much I love this die!?! You'll be seeing lots more of it this month! I began by blending a rainbow of Distress Oxide inks onto a piece of bristol cardstock. Next, I added some Stick It to the back of a black piece of cardstock and die cut the cutaway. Adding the Stick It before die cutting will help immensely when adhering the cut to the ink blended background! I cut a rectangular piece of black cardstock as well as the In A Word: Happy Cutaway. I temporarily adhered the word die to the black cardstock to aid in placement of the stamping, which was heat embossed in white using In A Word: Happy (the stamp set). Once the stamping was done, I added some ink blending to the sentiment along with some Glossy Accents, and once dry, I offset it with another die cut and adhered it to the black panel! For my next card, I used the holiday set In Bloom: Victoria's Very Merry Flowers with Lydia Evans to create a card that could be used for just about any occasion! I used my MISTI stamping tool for stamp placement on this card - and the bonus is I only had to place each stamp once - I just rotated the panel and stamped again for a perfect mirror image on the top and bottom. The sentiment, from Wishing You with Evelin T Designs, was stamped and heat embossed in brown, and a few purple Nuvo drops made the perfect berries! 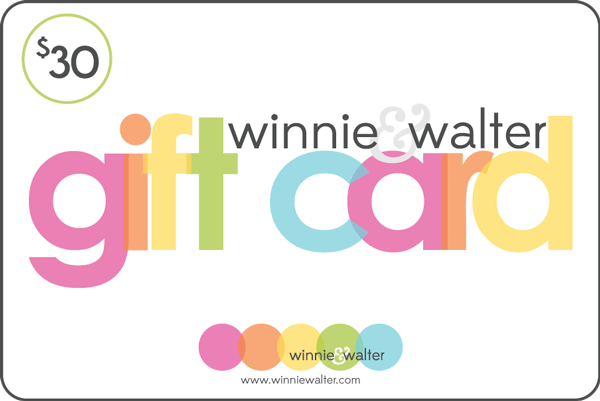 Thanks so much for joining me today on the Winnie & Walter blog! I'll see you again next Saturday with a few cards that use (gasp!) 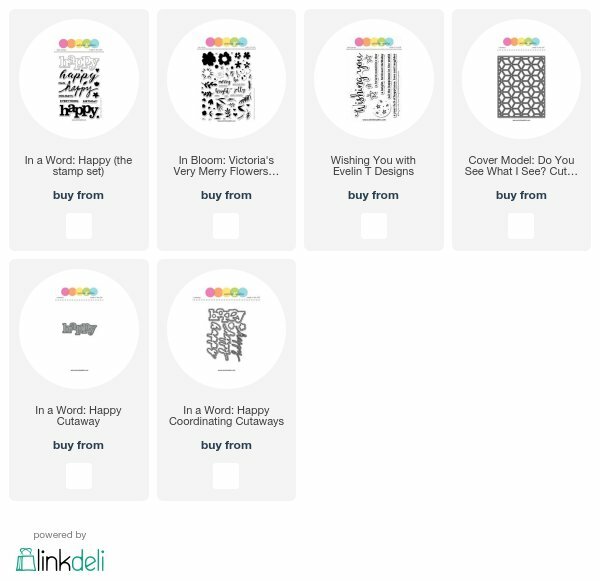 no stamping at all! Before you go - Shay has generously donated a gift certificate for me to give away on my blog! Head over there to leave a comment, and I'll choose a winner from one of the comments left on any of my Leading Lady posts through the end of December. I'll announce the winner on my blog January 2! Wow, bold and beautiful! Congratulations Kimberly! Wow! Two beautiful cards!!! Congrats on being the new December Leading Lady, Kimberly! Beautiful cards! Love the colors on the first one and pretty flowers on the second one! Congrats on being the Leading Lady this month! Your cards are fabulous! Fabulous choice for the December Leading Lady. I love the gorgeous cards of Kim's! The vivid colors against the black is totally stunning. Love the bright florals of the second card. Very pretty cards. I like the background on the first one. 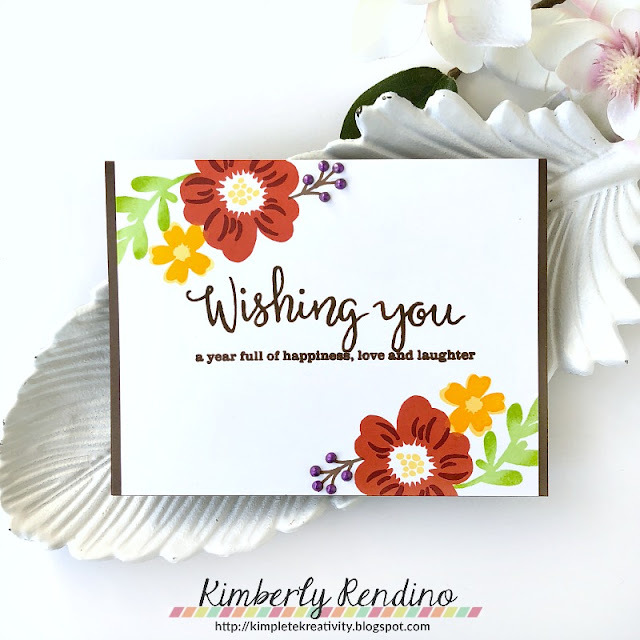 Love your cards, and so excited that my order with the great cover cutaway is due any day! Will definitely be watching for your posts thus month, love your style. Both your cards are just Fabulous... I love the dramatic look that ink blended background gives against black..It's simply Wowww! Love that pretty Wish card with the flowers and the awesome neon colored design with that cover die, wow! Both are so pretty, Love the first one most with beautiful blending and the Happy text is perfectly matched with pop of black! This is beautiful! I love the rainbow color and beautiful way you put this together! 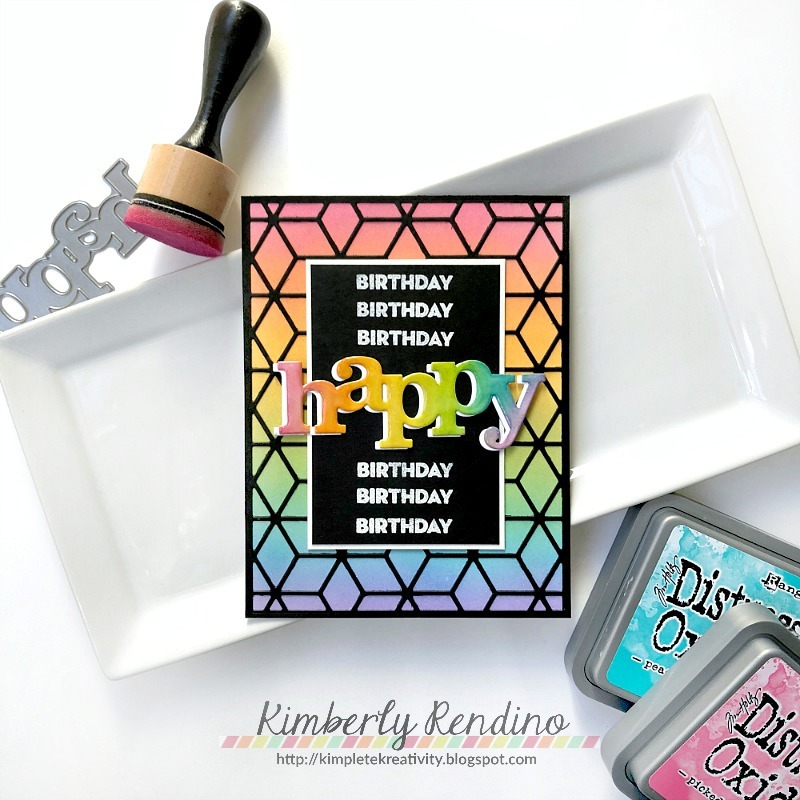 I absolutely love the floral stamping on Kimberly's floral card and the bright neon colors in her first. Another wonderful month of inspiration! Wonderful cards. I especially love the Happy birthday card. Great colors. Gorgeous florals and geometric background on your cards. Thanks for the inspiration. 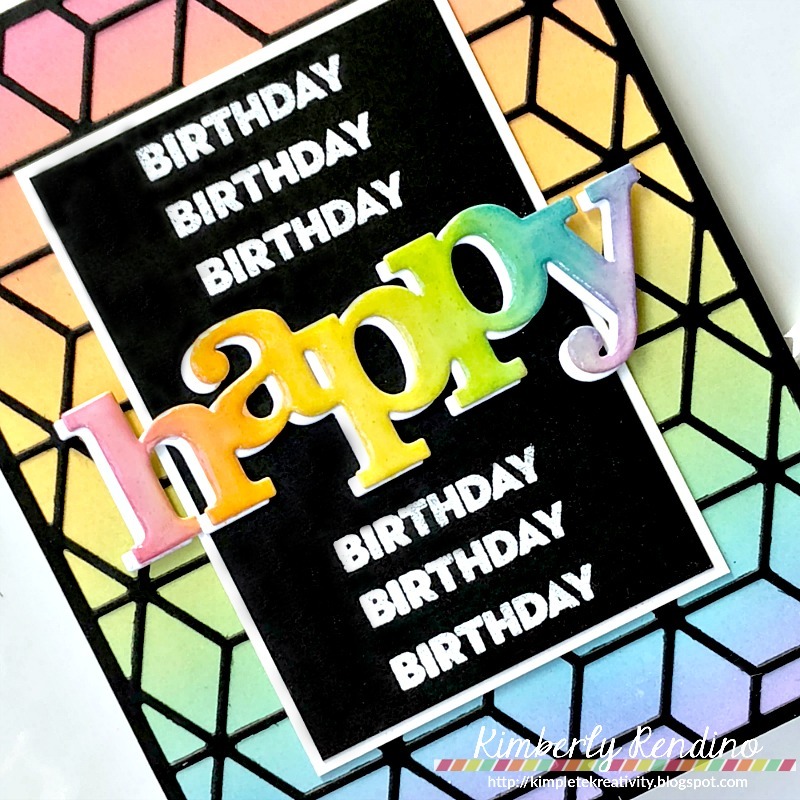 Beautiful cards, the rainbow Happy birthday card is so fun and the card design with flowers in opposite corners is so pretty. Great use of MISTI! So very beautiful! Love your style!